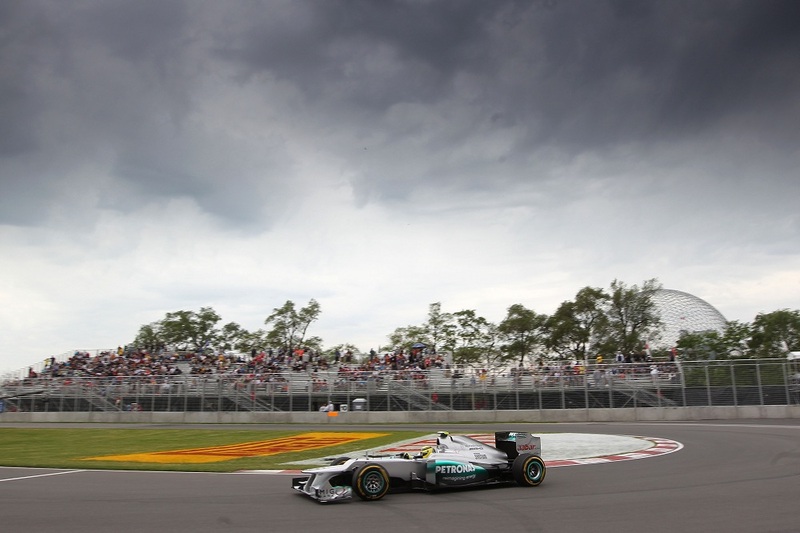 An eagerly awaited motorsport event for Canada as well as for the North American continent, the Formula 1 tour visit to the Circuit Gilles Villeneuve has held one of the series’ most physically-demanding races. A combination 14 technical turns and some high-speed stretches, the 4.361-kilometer (2.71-mile) holding the Canadian Grand Prix is also a torture test on the Formula 1 race cars. The seventh race weekend for the top open wheel racing series in the world, Day two’s biggest spectacle was qualifying for Sunday’s Canadian Grand Prix. Though the McLaren-Mercedes of Lewis Hamilton was showing the most impressive pace in Friday practice, the third and final practice on Saturday saw the top lap time coming from the Red Bull-Renault of Sebastian Vettel. In the afternoon time trial session, the two-time Formula 1 world driving champion was on top form throughout Circuit Gilles Villeneuve qualifying. In Q3, Vettel and his 1-minute, 13.784-second lap time won pole. After qualifying, the German driver Sebastian Vettel declared, “We were clear about the car today and able to improve step by step in qualifying. I’m very happy with the result and the laps at the end of qualifying, as we were able to improve each time. It puts us in a great place, but nevertheless tomorrow is more important.” With Vettel starting 1st on the grid and teammate Mark Webber positioned 4th at the start of the 2012 Canadian Grand Prix, the Red Bull Racing organization is still chasing their first victory at the Circuit Gilles Villeneuve. Little more than 3/10th of a second slower than Vettel, Friday’s fastest Formula 1 driver Lewis Hamilton placed his McLaren-Mercedes ahead of the Ferrari of Fernando Alonso and Mark Webber. In 5th place, Nico Rosberg’s Mercedes GP car starts 4 spots up from his teammate Michael Schumacher amounting to a 4/10ths of a second gap. Felipe Massa starts 6th in the second Ferrari with Romain Grosjean lining up in the 7th place grid position on the Canadian Grand Prix starting group. Other than the hot-lapping, there was only one incident on-track that added suspense to the Saturday afternoon at Circuit Gilles Villeneuve. As Pastor Maldonado attempted to better his 17th place spot in the last moments of the Q2 session, he left control of his Williams-Renault through turn 14. Spinning, Maldonado avoided serious damage to his race car. All 24 cars competing at the 2012 Canadian Grand Prix qualified for Sunday’s 70-lap race within the 107 percent rule. The main event is scheduled for 2pm on Sunday.